As you already know if you read my rare (but highly refined!) blog samples, I have spent a big chunk of my professorial career teaching statistical mechanics. And if you teach statistical mechanics, there is pretty much one thing you obsess about: entropy. 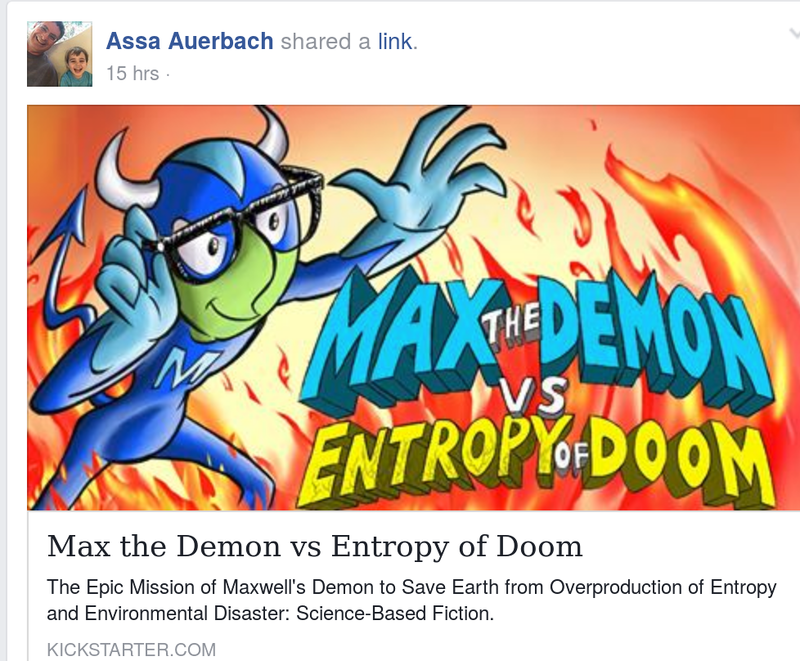 Apart from the plug for Assa Auerbach’s project (which, for full disclosure, I have just supported), I would like to use this as an excuse to share my lessons about entropy. With the same level of seriousness. Here they are, in order of increasing entropy. Quantify entropy by the cost (in $’s) of cleaning up the mess! Examples can be found at all scales. For anything household-related, we should use the constant. =$25/hour for my housekeeper. You break a glass – it takes about 10 minutes to clean. That puts the entropy of the wreckage at $4.17. Having a birthday party takes about 2 hours to clean up: $50 entropy. 2. Conjecture: Babies are maximally efficient topological entropy machines. If you raised a 1 year-old you know exactly what I mean. You can at least guess why maximum efficiency. But why topological? A baby sauntering through the house leaves a string of destruction behind itself. The baby is a mess-creation string-operator! If you start lagging behind, doom will emerge – hence the maximum efficiency. By the way, the only strategy viable is to undo the damage as it happens. But this blog post is about entropy, not about parenting. In fact, this allows us to establish a conversion of entropy measured in units, to its, clearly more natural, measure in dollar units. A baby eats about 1000kCal/day=4200kJ/day. To fully deal with the consequences, we need a housekeeper to visit about once a week. 4200kJ/day times 7 days=29400 kJoules. These are consumed at T=300K. So an entropy of S=Q/T~100J/K, which is also S~ in dimensionless units, converts to S~$120, which is the cost of our weekly housekeeper visit. This gives a value of $ per entropy of a two-level system. Quite a reasonable bang for the buck, don’t you think? 3. My conjecture (2) fails. The second law of thermodynamics is an inequality. Entropy Q/T. Why does the conjecture fail? Babies are not ‘maximal’. Consider presidents. Consider the mess that the government can make. It is at the scale of trillions per year. $ . Using the rigorous conversion rule established above, this corresponds to two-level systems. Which happens to quite precisely match the combined number of electrons present in the human bodies of all our military personnel. But the mess, however, is created by very few individuals. Given the large amounts of taxpayer money we dish out to deal with entropy in the world, Auerbach’s book is bound to make a big impact. In fact, maybe Max the demon would one day be nominated for the national medal of freedom, or at least be inducted into the National Academy of Sciences. This entry was posted in The expert's corner, Uncategorized by gilrefael. Bookmark the permalink.